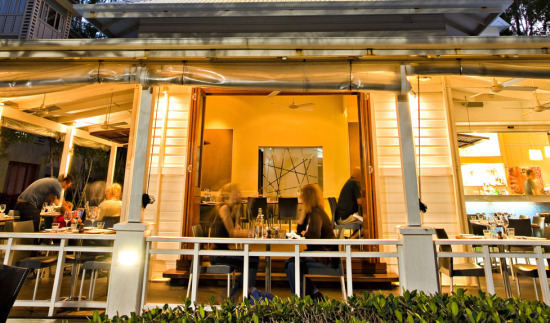 Dining in Palm Cove is a magical experience in this picture perfect location. You will find superb restaurants and cafes situated along Williams Esplanade with views out to Double Island and the Coral Sea. Choose from informal casual dining to romantic elegant beachside dining. Vivo Bar and Grill is an award winning beachfront restaurant situated at the front of Amphora Resort. 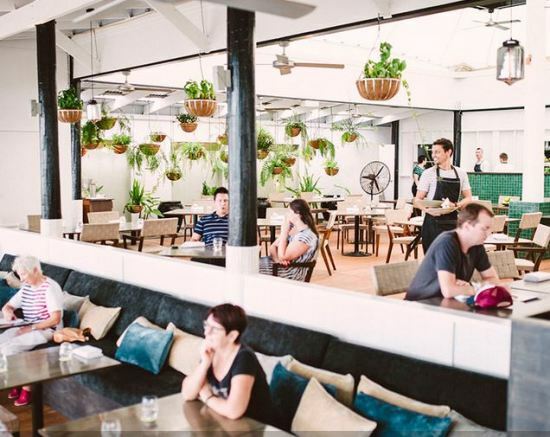 Set within a Queenslander style timber building with gorgeous wide verandahs and beach views, this stunning open planned restaurant captures the true essence of the tropics. Sourcing the finest local produce available, the menu at Vivo Bar and Grill is inspired by modern Australian cuisine with a Mediterranean feel and touch of Asian influence. Every afternoon Vivo offers happy hour (3-6pm) with an extensive cocktail list and an exciting tapas menu. What others are saying: "This place has it all. Gorgeous location, delicious food & great service. Will definitely be back. Had the stuffed zucchini flower for entree & pork belly for main then we shared the lemongrass creme brûlée OMG just sooo good!!" Located within the Alamanda Palm Cove Resort, multi-award winning Nu Nu Restaurant is the only one of its kind with absolute beachfrontage in Palm Cove. 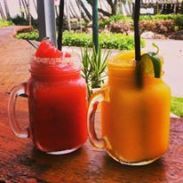 The menu at Nu Nu offers an eclectic mix of Australian food that is a reflection of the vibrant, colourful and dramatic landscape that is Tropical North Queensland. Nu Nu is committed to using local, and where possible, organic produce, ensuring the freshest, healthiest and most delicious food available. Their delicious artisanal bread is made twice daily on premises from a combination of old and new dough, using organic oneground flour. The starter dough (biga) was born in 2000 and continues to thrive to this day. What others are saying: "This restaurant is really the only one that is actually on the beach! An amazing ambience, a special place to go. My husband and I went there to celebrate our wedding anniversary and we weren't disappointed. A very innovative, modern menu. Beautifully cooked and beautifully presented. We thoroughly enjoyed our evening." 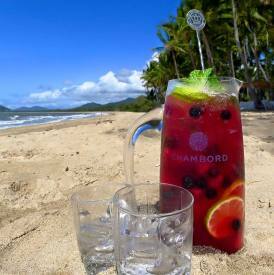 Beach Almond is an exciting Modern Asian Seafood restaurant and bar overloonking the iconic beachfront of Palm Cove. Set in one of the original beach shacks on Williams Esplanade, the dining room retains the humble charm of its former life with a large veranda capturing magnificent views and afternoon sea breeze. Famous for its vibrant Asian flavours and fresh seafood, this is casual seaside dining at its best. Our Pick: The best mud crab in the world. Cooked in either a Singaporean chilli or black pepper (Malay) style. What others are saying: "We love this restaurant and make it one of the top things on our to-do list when we holiday in Palm Cove. We've eaten there five times over the past few years and marvel each time how great the food is. 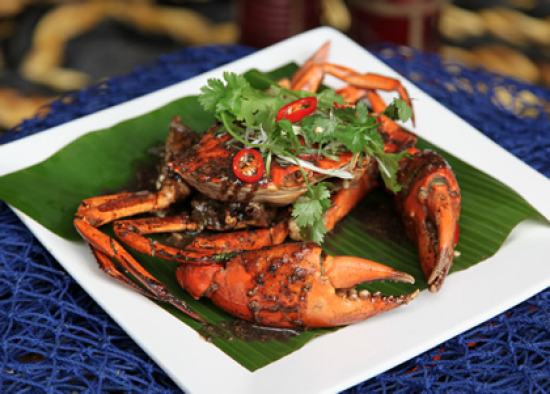 The finger-licking Singapore chill crab is the best we've had in a restaurant in Australia. And when you venture back, try the Bali black pepper butter prawns, a close second to the crab.The service is always friendly, without being intrusive, and the pleasant outlook across the Coral Sea just tops it all off." 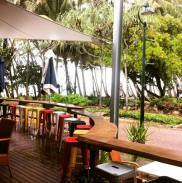 Apres Beach Bar provides an informal and casual dining atmosphere overlooking Palm Cove Beach. 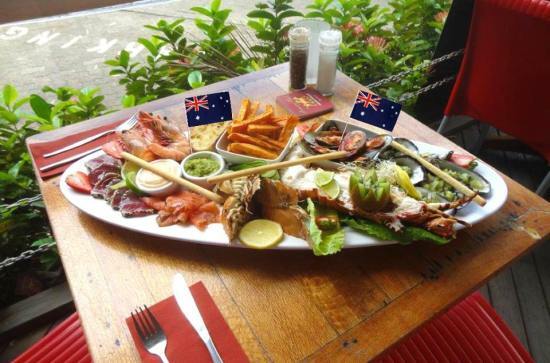 The extensive Aussie inspired menu includes kangaroo, barramundi, Laksa, Curries, pasta, Aussie BBQ Bush Platters, Crocodile, Emu and Cairns' best Angus Certified steaks. They also offer imaginative vegetarian meals, beach style snacks, a pub menu and child friendly choices.There’s always entertainment at Apres, whether it’s a live act, Karaoke or our famous Crazy Pianos, it will be a memorable experience. What others are saying: "Went to Apres for a lazy Sunday afternoon snack and beers. Excellent location overlooking Palm Cove. The mist spray out on the deck certainly helped with cooling us down with cold beers and tapas. Serving size of the tapas was way above what I was expecting and were delicious." With a sublime beachfront position, Chill Cafe capture's the very essence of Far North Queensland. Laid back and family friendly, Chill is loved by locals and holiday makers alike. There's nothing like starting the day with a good coffee and a Holy Banana Burrito or a Super Green Juice and Chill’s Tree Hugger Breakfast. All ingredients are fresh with every effort made to source best quality local produce. 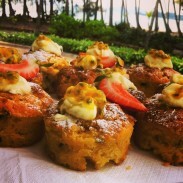 Open for breakfast and lunch, this is a must do for any visitor to Palm Cove. What others are saying: "Easy to see why this place is so popular. 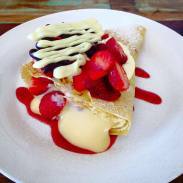 Excellent location, food is fantastic, service is sensational and you won't get a better coffee in Palm Cove than at Chill Cafe. 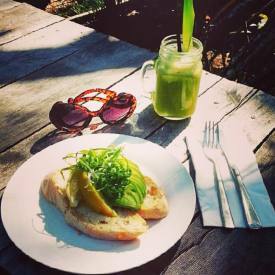 Freshly blended juices served in tea jars will please any discerning hipster. The food is delicious, good sized serves, reasonably priced and variety to cater for kids and the fussy." Jack & Shanan's is an exciting expansion of Palm Cove's much-loved Scoops Gelatiland. Owners Paul and Nicole make their own gelato on site using ultra-creamy, bio-dynamic milk from FNQ’s local dairy farm and flavoured with all natural ingredients. 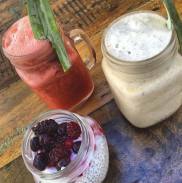 Whilst artisan gelato remains their core product, Jack & Snanan's additionally includes crepes, coffee, cocktails, cold-pressed juices, smoothies and raw vegan treats with a tropical FNQ twist. 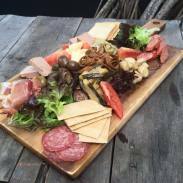 What others are saying: "One of the best anti-pasto plates I have ever had. The blue cheese was French and it was superb. The cocktails are sensational. I highly recommend the jug of the 'mule'. I could have had a lot more of those. Great location, excellent service. 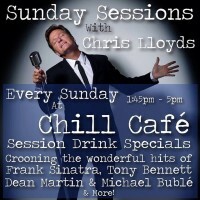 Will definitely be back"
Laid back and family friendly, Chill Cafe is the place where locals and holiday makers meet every Sunday afternoon. 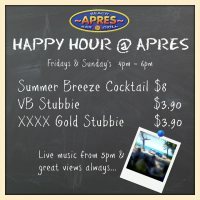 Soak up the atmosphere on the outdoor deck, with stunning views overlooking Palm Cove beach, Apres Beach Bar is the place to be Friday & Saturday evening in Palm Cove. 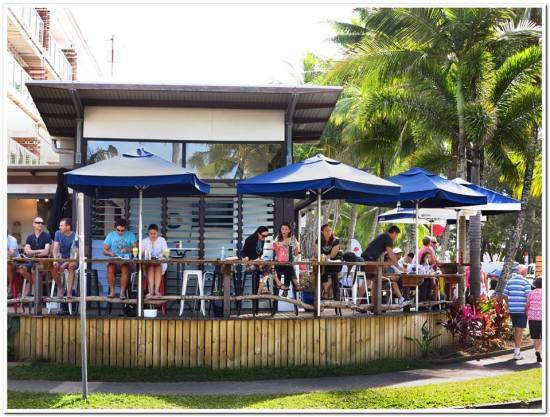 Norths Queensland's most iconic beach side dining. Gourmet Traveller Awards 2015. 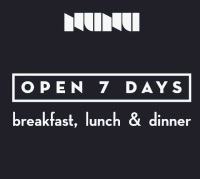 Australia's Top 100 Restaurants - NuNu #38. In-house guests at Peppers Beach Club & Spa Palm Cove can enjoy complimentary latest release family movies poolside at their 'Dive In' movie nights during school holidays throughout the year. Relax poolside with big people beverages while the kids enjoy gourmet hot dogs, popcorn, milk shakes and Movenpick ice cream. Subject to weather. 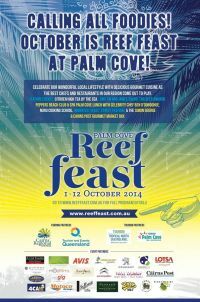 Reef Feast is the definitive gourmet food event in Tropical North Queensland. Celebrate the wonderful lifestyle of Tropical North Queensland, abundant seafood and the diversity of our tropical produce. Escape the big crowds and celebrate New Year’s Eve with friends and family on the beach at Palm Cove. Begin your night with dinner at one of Palm Cove’s many top class restaurants, before picking your spot on the beach for the 9pm fireworks display. Entry is free for fireworks, but it is advised to book your favourite restaurant in advance.